Rui En: Do you know who I am? Eh hello, she from Mediacorp ok! Because being an actress from Mediacorp makes you an authoritative figure, and gives you unprecedented power. 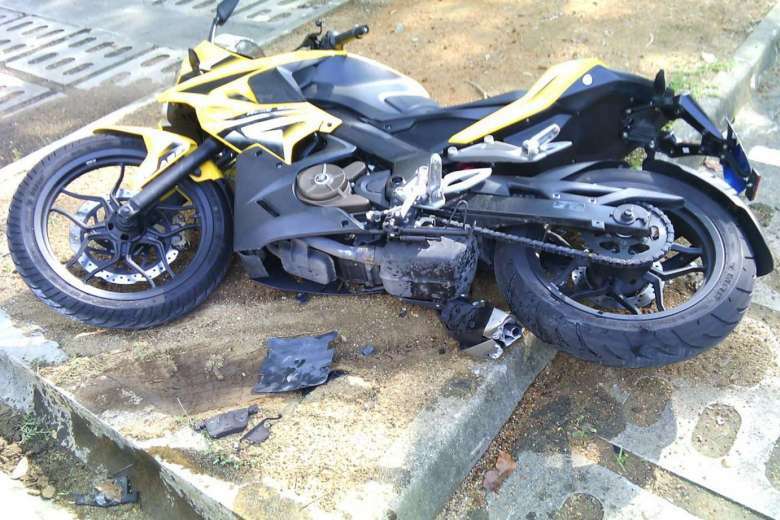 Mr Bahrom Sarmiten heard a loud bang as he was approaching his motorbike. 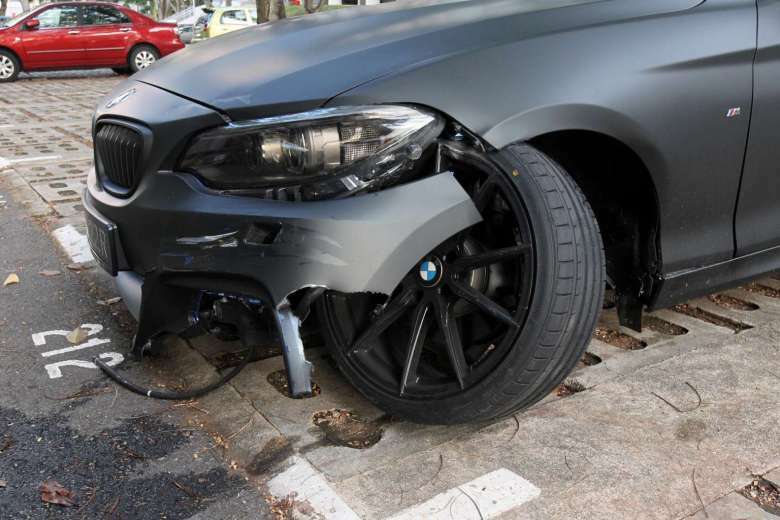 Lo and behold, his bike had fallen over after it was hit by a BMW that had also mounted the kerb in the process. 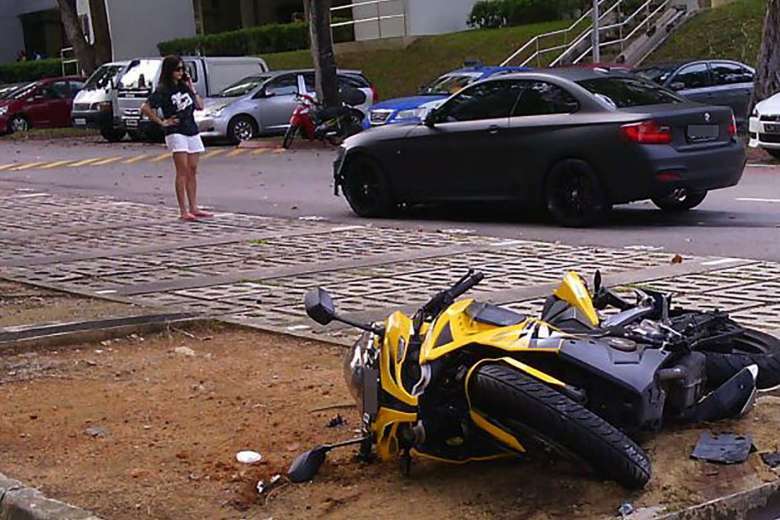 She also damaged both his motorbike and her car pretty badly. He said he was petrified and thought the car would stop. When it did not, “I didn’t want the driver to run away, so I quickly rushed to stop the car. I also knocked on the window and told her not to move”, he said. So she didn’t bother to stop, why the hurry? He said he had to knock a few times, before the driver stopped. She tried to shield her face, before she put on a pair of sunglasses and emerged from the car. Let’s not hit and run from this fact right here, “the first thing she said was: Do you know who I am?”. Look, even if you were Batman in the flesh, that doesn’t warrant you any special privilege for driving under the influence. Unfortunately for Rui En, Mr Bahrom did not have an inkling who the “megastar” was. Even if you did know who the person was would you just let the person get away with it and carry on with life as if all was good in the world? Mr Bahrom said Rui En hoped to settle things privately and offered him $2,000 in cash. But he refused because he did not think it would cover the extensive damage to his bike. Second blow of the evening, “It’s cash you know?”. We’re just going to believe she only said these things because she was under the influence. So we’ll end this article with some free damage control for the Channel 8 star. Next time don’t assume everyone knows who you are la. You usually only appear on Channel 8, go pick up a few roles on Suria and Vasantham if you want all of Singapore to know who you are la. And really, you think people will let you get away with drink driving just because you appear on TV? Also a quick public apology, star in a PSA for an anti drink-driving campaign, and you should be out of the frying pan Rui En. This is the product of our govt. Who cares who you are!!!! Lets see how the law is applied. Christopher Lee was fined, served a jail term and suspended from driving, likewise, Terence Cao was also duly punished. As the saying goes – even if Emperor commits a crime he shall be punished equal to a commoner. RUI EN is just another Singaporean. Will she still be getting any Red Star Awards – under our present – YES!!! cos she is a “PRIMA DONNA” in the eyes of Media Corps and fans.